North Korea, the cloistered, enigmatic nation nearly 7,000 miles from Washington, D.C., has again emerged as one of the biggest national security threats to the United States and its Asian allies. In late July, North Korea reportedly tested an intercontinental ballistic missile that experts say could be capable of reaching Los Angeles and other West Coast cities. It's the second long-range missile launched by the government in the last month, elevating its threat level and prompting the U.S. and South Korea to stage a joint missile exercise. 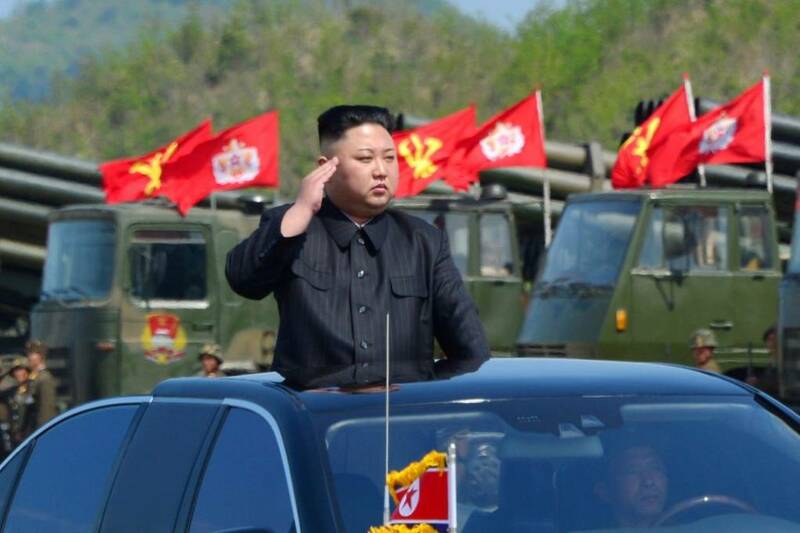 Among the most repressive, isolated and impoverished nations on earth, North Korea has nonetheless managed to successfully develop a huge army with an arsenal of nuclear weapons and ballistic missiles. And under the notoriously erratic direction of its young leader, Kim Jong-un, the nation has repeatedly threatened to strike U.S. allies in the region, including South Korea and Japan, where thousands of American troops are stationed. In response to rising tensions, Vice President Mike Pence in April visited South Korean and warned North Korea that the "era of strategic patience is over." And later that month, top Trump administration officials held a rare meeting at the White House to brief the entire U.S. Senate on what one senior aide called "a very grave threat" posed by North Korea. The administration, though, offered few details on how it planned to address the situation. Several days later, in an interview with Reuters, Trump said: "There is a chance that we could end up having a major, major conflict with North Korea." He added, however that he'd prefer to peacefully resolve the crisis. 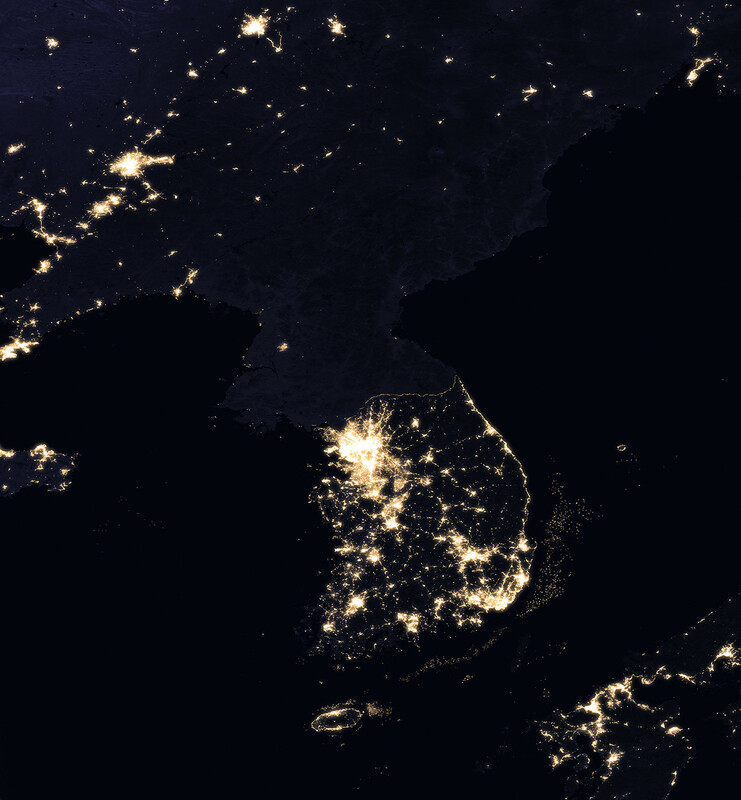 Bordering South Korea, one of Asia's most robust economies, North Korea has been walled for decades, a nation of roughly 25 million that's existed under the brutal totalitarian rule of the Kim family for three generations. Although reports of massive prison camps, food shortages, grinding poverty and shocking human rights violations elicit horror from outside observers, North Korea has also become a source of international intrigue as one of the world's last hermit kingdoms, a secretive society that few outsiders have ever set foot in. So how did it get like this? 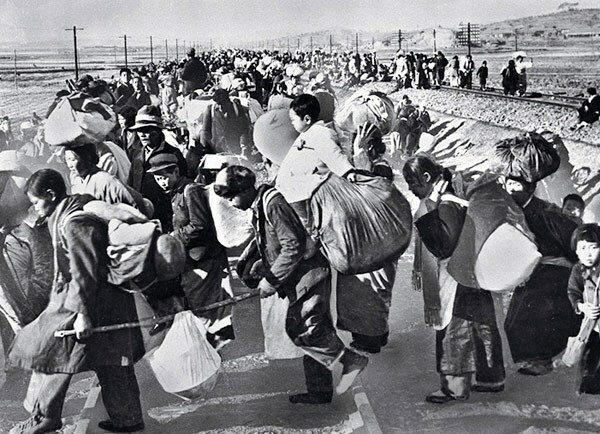 Japan colonizes Korea (north and south), beginning a 35-year period of often brutal military rule that include efforts to wipe out Korea’s language and cultural identity. The Japanese also introduce modern industrial development, especially in the north where coal and hydroelectric power resources are plentiful, prompting a mass exodus from the countryside to cities. Japanese rule ends in 1945, when U.S. and Russian forces capture the peninsula at the conclusion of World War II. By then, Korea is the second-most industrialized nation in Asia (after Japan). During this period, Kim Il-sung, the future leader of North Korea, emerges as a prominent guerrilla fighter in the colonial resistance movement. At the end of World War II, Japan surrenders to the Allies and relinquishes its control of Korea. The Soviet Union and United States agree to temporarily split postwar control of the peninsula until an independent and unified Korean government can be established. 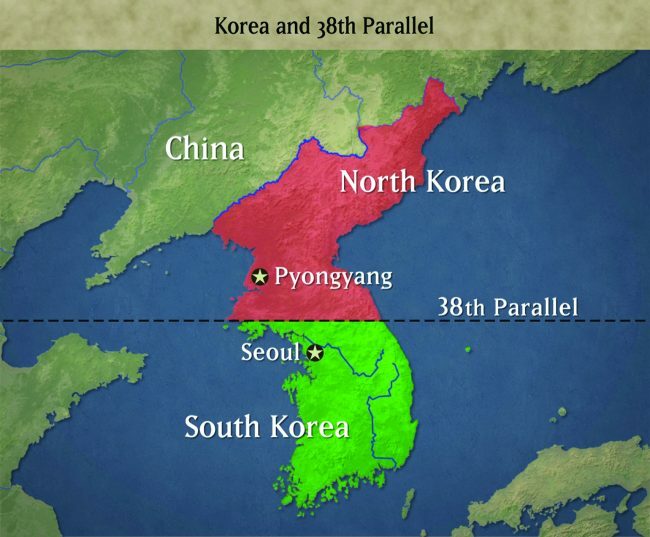 The Soviets occupy everything north of the 38th parallel. But as tensions grow between the two nations, efforts to forge a unified Korean government fall apart. By August 1948, the pro-U.S. Republic of Korea (South Korea) is established in Seoul, led by Syngman Rhee, a staunch anti-communist. Just three weeks later, the Soviet-backed Democratic People’s Republic of Korea (North Korea) emerges in Pyongyang, with communist guerrilla leader Kim Il-sung assuming power. Both leaders assert jurisdiction over the entire Korean peninsula and its people. On June 25, 1950, North Korean military forces, supported by the Soviet Union and China, invade the South in an effort to unify Korea under the leadership of Kim Il-sung. The U.S. comes to the aid of the South. Three years of intense fighting result in vast physical destruction and as many as 3 million casualties, including roughly 35,000 Americans. In 1953, both sides sign an armistice with a cease-fire line -- the demilitarized zone (DMZ) -– into approximately equal-sized territories. 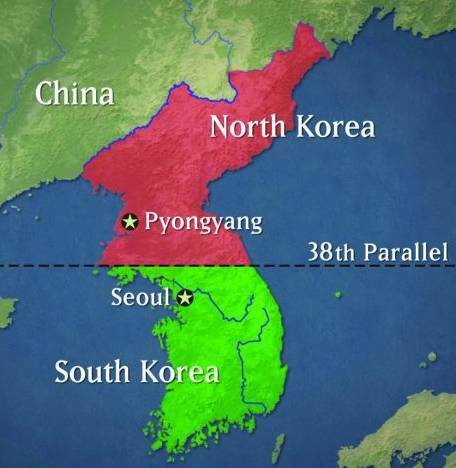 The now-heavily fortified border is in roughly the same position -- on the 38th parallel -- almost exactly where it was before the war started. The armistice is intended as a temporary measure, but a formal peace treaty ending the war is never actually signed (which means the war never technically ended). Under Kim Il-sung’s leadership, North Korea becomes a self-defined workers' state. It implements Juche, an ideology of self-reliance promoting Korean autonomy. The country institutes a command economy, a system in which the government, rather than the free market, determines production. The state seizes control of all private property and organizations, officially taking ownership of everything, including people’s homes, businesses, and even the clothes on their back. Land and agriculture are collectivized under state control. 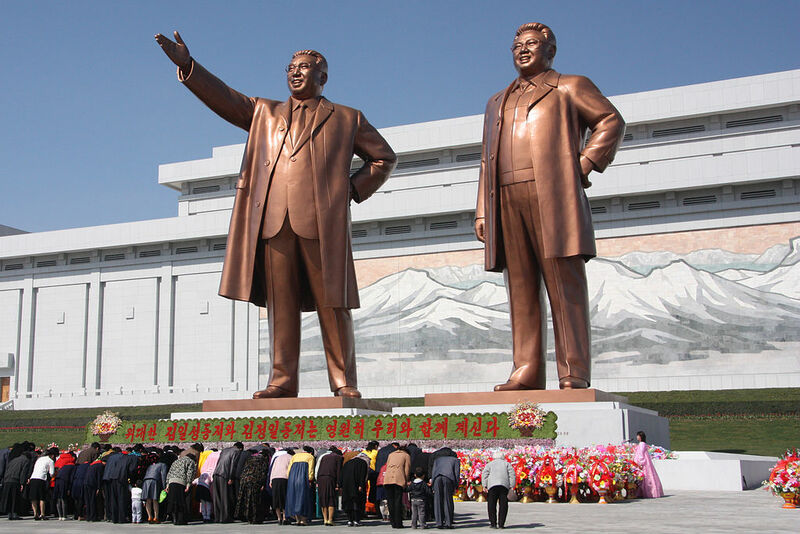 The regime rebuilds Pyongyang as a socialist capital, erecting numerous monuments to Kim Il-sung as part of a sweeping effort to build a cult of personality. It also takes over control of the media, restricts international travel and squashes any form of opposition, forcing dissenters into harsh prison camps. With major backing from the Soviet Union during the postwar reconstruction period, North Korea invests in mineral extraction and other heavy industries, rapidly developing its civilian and military economy at a rate that initially appears to outpace its rival to the south. For a time, urbanization continues to increase, as does school enrollment and infrastructure development. North Korea is billed a “workers’ paradise” by the state. It’s also during this period that the Soviet Union helps North Korea build nuclear reactors for energy production. But huge inequalities begin to surface, as the regime implements the songbun system that divides the population is divided into different social classes according to perceived loyalty. The new order dictates where people can live, what jobs they can have and where children can attend school. By the 1980s, though, as the South Korean economy begins to boom, North Korea stagnates; it continues to focus heavily on mining and steel production and fails to sufficiently innovate and diversify its industries. The economy is also dramatically impacted by the economic decline of the Soviet Union and Eastern bloc, its primary source of aid and trade. The collapse of the Soviet Union in 1991 leaves North Korea politically, economically and militarily isolated, with China as its only major remaining ally. In July 1994, amid this steep decline, Kim Il-sung dies of a sudden heart attack and is succeeded by his son, Kim Jong-il. The following year, widespread flooding destroys crops and infrastructure, prompting a three-year famine when the state-run economy fails to produce enough food. Hundreds of thousands of people die of starvation, while scores of survivors, particularly children, suffer severe malnutrition. As the state rationing system crumbles, a major black market economy emerges, with millions of North Koreans making or smuggling whatever they can sell or barter to survive. This underground economy takes root, and eventually forces the government to take marginal steps toward economic liberalization. Increasingly isolated, and without the protection of the Soviet Union, Kim Jong-il’s government announces a new policy called “Songun," or "Military First.” It makes the Korean People’s Army the state’s most powerful political and economic force in the nation, and the largest recipient of resources. Under this new system, North Korea uses its nuclear reactors to begin developing a nuclear weapons program. By 2003, it withdraws from the 1995 Nuclear Proliferation Treaty. Three years later, North Korea claims to have successfully tested its first nuclear weapon, prompting the U.N. Security Council to impose a broad array of trade and travel sanctions. Despite U.S. and international efforts to halt its nuclear ambitions, North Korea continues to develop its arsenal and conducts subsequent tests. After the death of Kim Jong-il in 2011, his son Kim Jong-un, still in his mid-20s, takes over as North Korea’s third supreme leader. Portraying himself as a modern version of his grandfather, he purges, demotes and, in several instances, executes regime officials to further secure his power base. The new regime cracks down on border crossings and further limits access to foreign media and internet. Despite initial hopes from outside observers that Kim will take steps to mend his nation’s frayed relations with the West, he continues to consolidate power threaten other nations – most notably South Korea and the U.S. – and accelerates the development and testing of nuclear weapons.